Biology is the world's greatest manufacturing platform, according to MIT spinout Ginkgo Bioworks. The synthetic-biology startup is re-engineering yeast to act as tiny organic "factories" that produce chemicals for the flavor, fragrance, and food industries, with aims of making products more quickly, cheaply, and efficiently than traditional methods. "We see biology as a transformative technology," says Ginkgo co-founder Reshma Shetty PhD '08, who co-invented the technology at MIT. "It is the most powerful and sophisticated manufacturing platform on the planet, able to self-assemble incredible structures at a scale that is far out of reach of the most cutting-edge human technology." Similar to how beer is brewed—where yeast eats sugars and creates alcohol and flavors through fermentation—Ginkgo's "hacked" yeast eats fatty acids and produces desired chemicals that recreate certain scents and flavors during fermentation. Those chemicals can then be extracted and used in a number of different products. Co-founded in 2008 by famed MIT synthetic biologist Tom Knight '69, SM '79, PhD '83, Ginkgo's microbes now serve as the basis for perfumes, cosmetics, organic pesticides, and sweeteners for more than 20 big-name clients. A major partner, French fragrance manufacturer Robertet, for example, contracted Ginkgo to design yeast that produces a rose scent. Doing so is cheaper and less time-consuming than the traditional method of finding and squeezing oils from the flower's petals. The "cultured rose" is still under development, along with an expanded palette of other scents under contract, such as apricot, mango, and coconut. Ginkgo's most recent partnership, finalized in June, is a collaboration with California-based bioproduct firm Amyris. Both companies will combine forces to rapidly scale up the production of more than 20 ingredients for new products, such as skin care products, industrial lubricants, and jet fuel, over the next few years. In addition to Shetty and Knight, who is a former researcher in MIT's Computer Science and Artificial Intelligence Laboratory, the other Ginkgo co-founders are Jason Kelly PhD '08, Barry Canton PhD '08, Austin Che PhD '08. Big facilities for tiny "factories"
Ginkgo's clients often use ingredients, such as rose petals, that are expensive, not always available, or have environmental sustainability issues. Shetty says Ginkgo helps make the client's "supply chain more stable, more efficient, and more sustainable." Ginkgo's engineers are constantly designing different enzyme pathways and different genetic architectures, and amassing data on each sample. In that way, the foundry serves as a giant platform for designing yeast for a wide variety of applications. 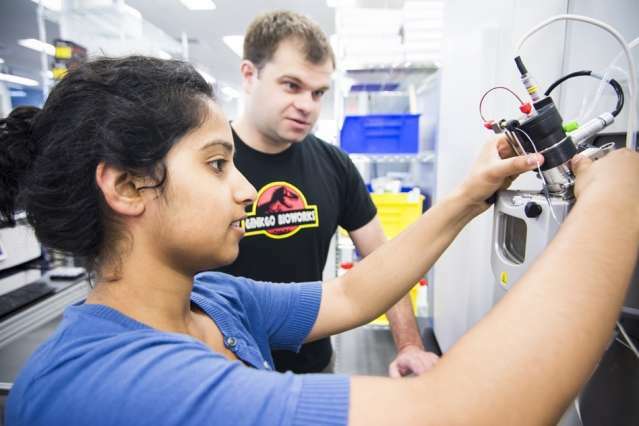 "We have always approached biological engineering and the foundry as generalists, not specializing in a particular organism or process, but building out automated tools that give our organism designers the broadest access to the power of biology," Shetty says. "If we can learn how to design with biology well, then there is potential for tremendous impact across all technologies." In the fall, Ginkgo plans to open a second foundry with upgraded technologies that's 25,000 square feet, called Bioworks2. "We're really excited by how the technology has evolved and excited for what's coming and what we'll be able to do with an expanded capacity from the addition of the new foundry," Shetty says. The Ginkgo co-founders came together during the mid-2000s while doing their PhDs in synthetic biology, which "just a handful of people were talking about" at the time, Shetty says. All four were working under Knight, who is considered by many to be the "godfather of synthetic biology" for his pioneering work in the field starting in the late 1990s, and former MIT professor of biological engineering Drew Endy. Ginkgo doesn't use the BioBricks standard, but the idea of simplifying and scaling up synthetic biology became a catalyst for the startup. "All of us fell in love with the idea of being able to design biology," Shetty says, "but knew that what was holding back progress was the lack of good tools and technologies with which to engineer organisms. So we started Ginkgo with the mission to make biology easier to engineer." At first, the co-founders tried scraping together seed money to build new tools and facilities for synthetic biology, but investors weren't biting. They also entered ideas for new synthetic-biology tools into the MIT $100K Entrepreneurship Competition but never made it past the first round. However, inspired by a fellow MIT alumnus who had started a company from scratch with friends, "We decided to just go for it," Shetty says. "Everyone thought you needed a bunch of money to start a biotech company. We, instead, just bootstrapped Ginkgo from scratch." In 2008, the four alumni and Knight—who had left his position at MIT—set up Ginkgo in Boston's Seaport District, where its headquarters remains today. Bootstrapping for several years, the startup built a series of automated tools for assembling DNA, transforming cells, and collecting data on microbes. In 2015, they built their massive foundry around those new advances—the culmination of nearly a decade of work. "[The foundry] has finally become a reality, and it's a bit surreal to actually see it in action," Shetty said in a 2015 interview with the Huffington Post shortly after the foundry's launch. Today Ginkgo is hitting growth mode, Shetty says, with aims of rapidly expanding the number of customers and employees, and building new facilities: "We are still iterating and evolving on our approach to each step in the foundry, as we grow into Bioworks2 and beyond."